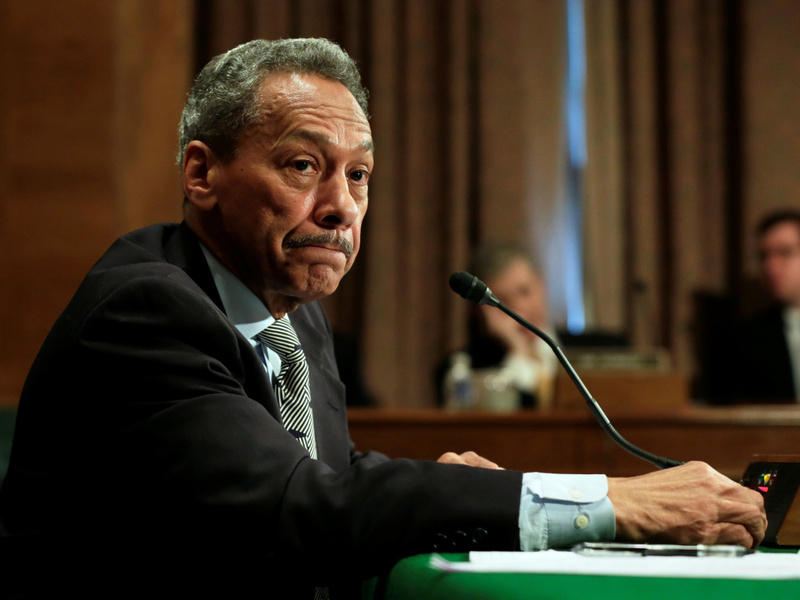 Federal Housing Finance Agency Director Mel Watt testifies at a Senate Banking Committee hearing May 11, 2017. A female employee says her secret recordings show that he held up her pay raise as he pressed her for a relationship. Melvin Watt, the director of the Federal Housing Finance Agency, stands accused of sexual harassment. Simone Grimes, an employee at the agency, says she secretly recorded conversations with Watt and that the recordings bolster her harassment, retaliation and equal-pay claims against Watt and the agency. In 2015, she had been filling two jobs — hers and one she'd been promoted to. But she never got the pay increase she'd been promised. That decision, she was told, would require sign-off from the director. Grimes, who is in her early 40s, kept asking to have her pay match that of her predecessor. Each time, she was told the decision was Watt's. In May, Grimes filed a complaint with the Equal Employment Opportunity Commission, and on Monday she also filed a lawsuit against the housing agency for alleged violations of the Equal Pay Act. Watt, whose agency regulates housing giants Fannie Mae and Freddie Mac, is one of the few top holdovers from the Obama administration. He has denied the allegations, and faces multiple federal investigations. But Grimes says conversations she recorded on her cellphone with Watt over the last year and a half prove otherwise. "Is it better to go through a charade process to get you the job, or is it better for me to just give you the job, because I don't have to go through a bid process, I don't have to go through an application process," Watt said on the tape. The agency and Watt declined to comment about the recordings. Watt's 5-year term as head of the agency expires in January.